The Benjamin family has a long history on Mackinac Island. Robert H. Benjamin, his wife Hulda, mother Kate and son Herbert arrived at Mackinac in June of 1885 where Robert worked as a blacksmith and served as mayor of Mackinac Island. 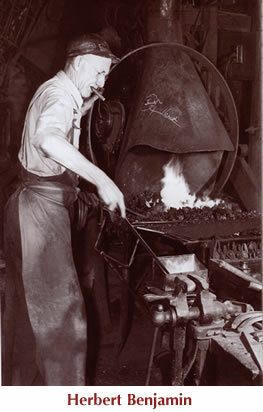 Herbert eventually took over the blacksmith shop located on Market Street. This original blacksmith shop, donated by the Benjamin family, is now operated as a museum by Mackinac State Historic Parks. In 1922 Herbert Benjamin married Mary Foley whose family operated a photography studio on the island. Herbert and Mary's children, Robert E. and Dorothy, were born on the island. Robert worked with G.H. Wickman in his photography studio until Wickman died at the Lakeview in 1950. Robert purchased his shop on Main Street, the site of the current Benjamin Photo & Gift Shop and began creating his own line of postcards. Dorothy operated the Picture Shop and created well-known horse and buggy designs for both businesses. Both shops now feature distinctive gifts and souveniers of Mackinac. Robert E. Benjamin's extensive inventory of Mackinac photos are featured on many postcards and he maintains a unique collection of vintage postcards originally published by G. H. Wickman and the Benjamin family. Learn more about Mackinac history, the Benjamin family, photography on Mackinac and the origins of the postcard trade on the island by reading Robert E. Benjamin's books available on-line.